As you do on a Sunday morning, I decided to pull everything out of the pantry and onto the kitchen floor, there is a reason for my madness. 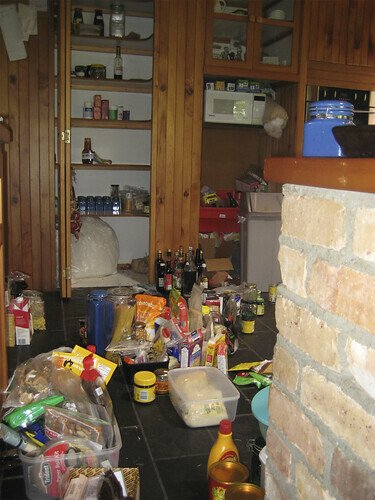 Everything else went into the cupboard in the laundry. Not to be thrown out, not to be left unused, but to remind us of the extra effort these foods require, the carbon miles they accrue just to get to us. We had food from Australia, Japan, Sri Lanka, America, Italy and China to name but a few. Much of it was organic, most of it was actually in the “real food” category, so it wasn’t too bad a pile. However, it disturbed me to see things I consider to be basic necessities that are all imported. All our oils, pasta, rice, vinegars and sugar, possibly the flour too but I’m checking up on that one, all come from some other country. We live in a wine growing country, how hard is it to turn some of those grapes into vinegars? We have a huge sugar factory that makes sugar products, golden syrup etc, but all the sugar comes from overseas (probably Australia so not too far but still). We live in a world that takes food for granted, we don’t bother to think how far that item has had to travel, the working conditions of those growing or processing it for distribution, the chemicals going into the ground to produce it, the unsustainable conditions used. I remember earlier in the year feeling “uncomfortable” that our bananas came from Ecuador (not even Australia!) because we had decided to choose organic and I didn’t want anyone deprived of fruit (bananas were actually one thing I really wanted in those first months of my pregnancy, I was eating at least one a day when normally I might have one a year). Now I’m afraid if anyone wants bananas they will have to settle for our home grown “lady finger” variety and may even have to deal with frozen over fresh. I dragged Craig out of bed to join me over the food pile and waited (im)patiently for Buffie to also wake up, I needed to draw them both into this discovery, discussion and new plan. We are going to try to be “Locavores” of some type. We are going to attempt to buy locally grown, locally made products, expand that to NZ wide and include a few special items such as herbs & spices (as they require very little to produce and transport), Fair Trade chocolate & coffee and also sugar. We are going to try to put nothing in the pantry that does not fit this category. (oh crap!). So far I have a local source of goats milk for us, I’m working on the cows milk. We can get oil from the local market but it’s going to be very very expensive considering how much we use (especially during the preserving seasons). We are about to get a grain mill so will mill our own grain for flour. Oh, there is one more exception area and that is for Buffie, she’s allergic to the wheat family and can’t have lactose. Because this has already wrought huge changes to her life and diet we don’t wont to make life more difficult for her at home, so she gets to have a few extra special items (such as soy & rice milk, rice crackers etc). We will start to work towards making our own flours for making bread, pastry & pasta for her at some point. I need to find a source of vinegar for all my preserving and how on earth am I going to substitute vegemite! I used up the last of the flour tonight to make 4 loaves of courgette bread (to freeze) and potato, courgette & corn fritters for dinner. Interestingly, I made Buffie’s courgette fritters with Quinoa flour and they tasted better then the other ones, had more flavour to them and held together better, so I think that recipe will happily get the locally grown switcharoo. I’m really looking forward to the market this weekend now, I need bread from our local baker and pasta from the pasta guys, as well as mounds of fruit and veg that we didn’t grow or grow enough of so that I can start getting winter soups and things into the freezer (potato & leek, and tomato are the top of the list). I’m also going to have to pop into the butchers for some chicken carcasses to make up some stock. So to end, I want everyone reading this to have a quick look in your pantry, check out where your food is coming from, what’s in it, do you use it? I’d be interested to hear if others move further towards the locavore mindset too. What is Peak Oil, and how does it affect hand crafters and homesteaders? When Tracey, Buffie and I talk about how to run our homestead, or practice our crafts, one thing which often shapes the conversation to a large degree is an understanding of peak oil. Recently Tracey mentioned that I’d been writing as if this was a universally understood concept, when perhaps it merits a little explanation. You might have heard the phrase “peak oil” in the news recently, particularly as the price of oil was spiraling upwards in the first half of this year. If you’re not already familiar with it, stay with me for a moment while I explain what this term refers too. Since we first started to extract oil commercially (about 150 years ago), we’ve discovered more and more of the stuff under ground. Initially, it was used for lamps, and then we started making petrol cars and wanting more and more of this black oily stuff to power them. As people demanded more, we built more and more oil derricks, and pumped more and more of the stuff out of the ground. With a few exceptions, each year since we started extracting it we’ve extracted more oil each year than we did the year before. Now oil is a finite resource. There’s only a certain amount of it under the ground. It’s made by a naturally occurring process, but that process requires certain geological conditions, like warm seas full of plankton blooms. It occurs on earth every two hundred million years or so. The point here is that the ground isn’t magically making more oil as we speak, and so within the timeframe of the human species, we can consider oil to be a once-off limited resource. Since there’s a limited amount, clearly we can’t go on extracting more and more each year. This isn’t a “theory”, or in dispute in any way, it’s simply an unavoidable fact. At some point will come the year that we’ve pumped the most oil we can in any given year, and the next year we’ll pump a little less. It’s hard to spot when that year is for the whole world, except in hindsight. In a particular country though, it’s much easier. In the 1950’s, a geologist named M. King Hubbert predicted that the peak of oil production in the USA (which was the world’s biggest oil producer at the time) would be 1970. At the time he was laughed at, but the peak turned out to be only a couple of months into 1971. Since then, no matter how many new oil rigs the USA builds, it still produces slightly less each year. From being the world’s biggest produces, the US now imports about two thirds of it’s oil needs. So basically, “peak oil” is that point where we’ve used up about half of the oil in the ground, and now it’s no longer coming out faster and faster, but is in fact slower each year. The global oil peak is really hard to compute, but most oil geologists suggest that it was last year, this year, next year maybe, or in other words, around about now. So are we running out of oil? Absolutely not. There’s still around a trillion barrels of oil in the ground around the world. What is happening though is that we get a little less of it each year, and unfortunately our whole society is based on the idea of growing each year. There is a lot that can be said about what this means. Opinions on what can happen range from a slow shift to alternative energy technologies (hopefully renewable ones) to the total collapse of society as we know it. The truth probably lies somewhere in the middle. What does it mean for crafters, homesteaders and pioneers like ourselves? Well, on that front I like to look at the good news. For starters, the world is growing again. We used to talk about the world shrinking, about global markets and just-in-time delivery systems. In the last year, the cost of shipping goods internationally has approximately doubled. The cost of airline flights has increased, and about 20 airline companies have gone bankrupt this year, with predictions that it’ll include another 30 before the year is out. It’s no longer economically profitable to earn a livelihood from local crafts because it’s hard to compete against products made in factories in China, and elsewhere around the world. As transport costs go up, this starts to change. Higher transport costs mean less ipods and world trip holidays, but they also mean more local jobs and more locally made products. Oil is also incredibly energy dense. There is so much easily available energy in a barrel of oil that other technologies we have for generating power don’t look able to make up the gap in the near future. In a world with less energy available each year for running complex machines, you can easily imagine that the things that people find valuable economically will change. Expect hands-on people, particularly those growing food, to be much more valued in such a society. I’m by no means a luddite. I’m a computer programmer, and like listening to my ipod while knitting my own socks. I’m not suggesting that a return to an agrarian society is going to happen, or is desirable, but I think that at the moment we’re a little out of control and could use a bit of time to slow down and value the things that are just outside our front door. It’s my hope that we’ll navigate all these changes well, and perhaps end up with a world where surfing the internet and weaving (or woodworking, blacksmithing, sewing, etc) are all highly valued. I’ve mainly covered the good side of things here, and there are also plenty of dangerous waters to navigate in the years ahead, but I think that it’s easy to dwell on these a little too much. For more information about peak oil, how it relates to climate change, and what people and communities can do to adapt to the changes being forced upon us, I’d recommend taking a look at the Transition Towns network. If you want a more balanced and properly researched and referenced explanation of peak oil, check out this page from the Oil Drum website. We’re renting our homestead, and every now and then we have a think about where we might like to eventually buy one. We’re pretty sold on the idea of going north, rather than south, so we’ve been busy getting to know the northlands and yesterday we took off on another impromptu land scouting mission. I say land scouting, but although we did look at property prices, it’s perhaps more correct to say that we were region scouting. We’re trying to figure out which areas we should look at more closely. 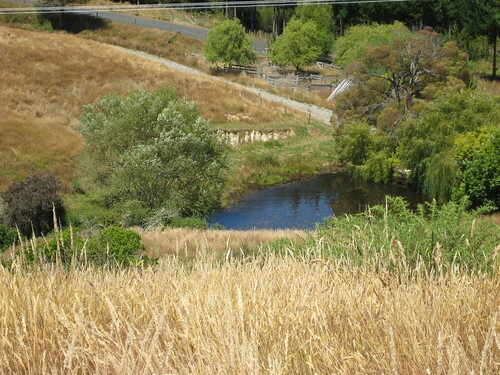 The area we are living in, on the edge of Swanson, is quite beautiful, but the downside of being so close to Auckland is that land prices are high due to the common desire of buying a small lifestyle block and commuting to work in the big city. Unless something very dramatic happened to shake up this pattern, we couldn’t afford to buy in the area we’re currently living in. If you look at property prices, there’s a magic circle around auckland where land that is within commuting range of the city is subdivided for premium prices. Anyone wanting to buy within that land is probably best served by waiting until petrol gets more expensive, and then buying in areas that are currently seen as a reasonable commute by car, but don’t have access to the train, as I’d guess these will come down in price. Failing that, it seems best to look further away. As one drives north of Auckland, the magic circle of expensive land seems to extend to about Warkworth. Warkworth has the feeling of a country town, but it’s strongly influenced by the influx of commuters and also the tourists passing through. This, and all my perceptions of Northland towns is fairly uninformed. I’ve on been living in NZ for a couple of years, and I’m trying to judge them based on rather short visits. However, it’s the only viewpoint I have, so lets press on further north. Next major stop up the Route 1 is Wellsford. Wellsford feels to me like it’s less influenced by Auckland, and has all the ingredients of a real country service town. It’s the major destination for lots of farmers east of the Kaipara to get all their agricultural bits and bobs. It’s also got the major highway of course, and so is used by tourists visiting their batches as well. It has a McDonalds, and a tiny bit of “mini-suburbia”. North of Wellsford is Kaiwaka, which is a bit of a favourite of mine. Kaiwaka is now fairly popular with lifestylers who want to move to the country, stop working regularly in town, and set up their beautiful little homestead. Retail stores in Kaiwaka include the gourmet cheese shop, the excellent italian bakery, and the very creative cafe Eutopia. These tend to indicate that there are a fair few affluent people in the area now, and also a fair few people who “a little bit hippy” (like me). To round off that last demongraphic, Kaiwaka is home to two lovely ecovillages and the Koanga Gardens store. So being a middle class greenie myself, you can see why I would like Kaiwaka, but I’m curious about it’s resilience in the face of future change. 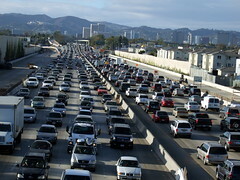 It’s success is at present very much determined by the lifeblood of traffic traveling up and down route 1. Without that, it’s retain stores would have to adapt, and the town itself currently doesn’t have much in the way of economic activity centered around country life, with the main exception of the Sawmill. Mainly I mean that I imagine a lot of local farmers currently visit Wellsford for many of their needs. I’m pretty confident about Kaiwaka’s ability to rise to meet these challenges in a post oil world. 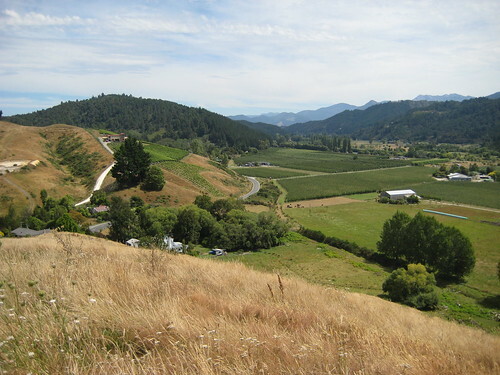 In particular Kaiwaka has one of the most active Transition Town groups in the Northlands, and the skills and people at Otamatea and Kohatu Toa ecovillages shouldn’t be ignored. In an optimistic powerdown future, then I could see Kaiwaka really leading the charge with creative responses to a future with less oil. In the case of a future involving a bit more of a sudden collapse, then I wonder if I should be looking for places with more resilient local infrastructure. Perhaps there’s an advantage in being surrounded by experienced and practical local farmers, rather than idealistic lifestylers (even if I’m in the latter category myself). Yesterday’s drive through the country had two main purposes. 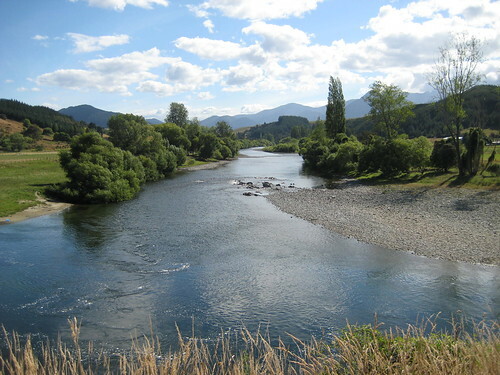 Firstly, to try and find some places that might work well in the latter situation, and secondly to explore the potential of towns with water access to the Kaipara harbour. These two goals together lead us to Dargaville, which is on route 12, the tourist route for the west coast, and is on the Wairoa river, a great big fat (and brown) river feeding into the north end of the Kaipara. Dargaville is traditionally a port town, and although on the river it does appear that it was once regularly visited by ocean going ships. In it’s early days, it’s main industries were logging Kauri trees and digging up Kauri gum. It has a few historical attractions for the tourist, like it’s museum, but mostly it’s a true service town for quite a large surrounding area of farmland. 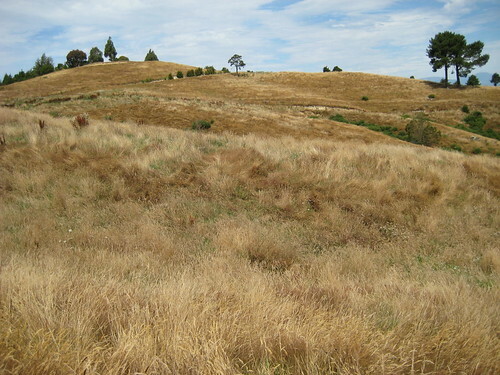 There aren’t any Kauri trees to been seen anymore, but this area now prides itself on being the kumara capital of NZ. Apparently the soils to the west of Dargaville are fairly sandy, compared with the usual clay based soils, and good for growing kumara (and no doubt many other things). 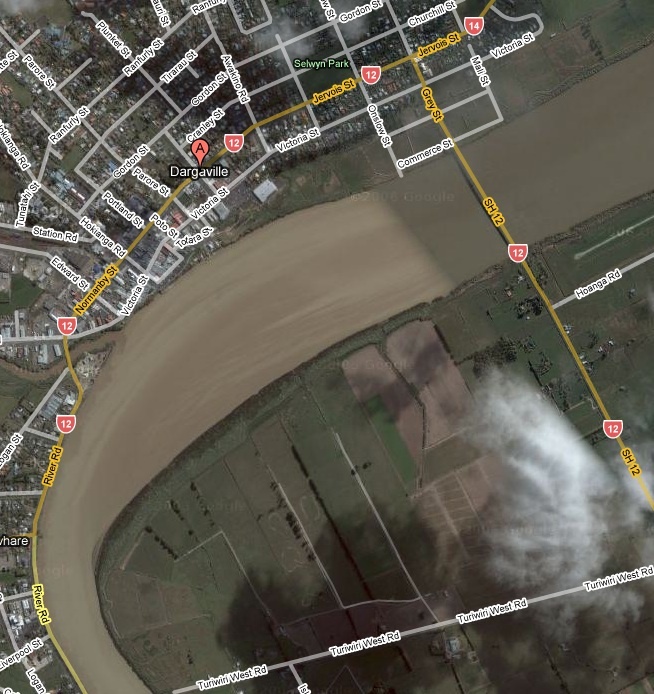 As well as being a port, Dargaville has a train line. It goes up to Whangerie, or down to Auckland. Unfortunatelly, it doesn’t run passenger services, only cargo (there are no regular passenger trains in the northlands), but I’m still going to call that a significant asset. In a post oil future, I’d predict that Dargaville’s role as a serious farming area, in particular one that grows a lot of carbohydrates (kumara) as well as the usual cows and sheep, will make it a vital food source for Auckland. I also like to imagine a revival in water travel. The end of the current passenger line from Auckland is Helensville, and from there one could board a boat and travel in basically a straight line across the Kaipara to Dargaville, rather than the long way around that the road takes. I’m keen to give this trip a try and see how long it takes. What are the downsides of Dargaville? Well, for starters, I might not find many people I get along with. I am a bit of a hippy and a middle class city boy at heart. Also, the area around Dargaville is dead flat, and my dream property always has rolling hills and mountains in the background. Not just flat, Dargaville is also pretty close to the water. I’m pretty worried that only a few metres of sea level rise will put it under water. Seeing both these positives and negatives in Dargaville, we continued to follow the Wairoa river north east, thinking that as it got a bit further into the hills, we might find our perfect landscape and still have access to water transport. There are no other major towns in that direction, so if you lived up that way you’d want to be able to reach Dargaville by boat in a reasonable amount of time. However, the landscape is stunning. The river winds it’s way through meandering valleys, with mountains rising up in the background. The train line also follows the river. Transport by water, road and train. Beautiful scenery. Affordable land prices. The only downsides might be the isolation (it’s a fair way from Auckland), and possibly the lack of like minded people. We’d love to hear your thoughts on the sort of area you live in or would like to live in, and how you think it might function if oil was scarce and expensive.